HATS OFF TO THE 2016 NORTH SHORE HIGH SCHOOL GRADUATES! It was a gorgeous day as over 225 North Shore High School seniors donned their caps and gowns for the 2016 Commencement Ceremony. Congratulations to all of the North Shore High School graduates and their families who attended the 2016 Commencement Ceremony on Friday, June 24, 2016. 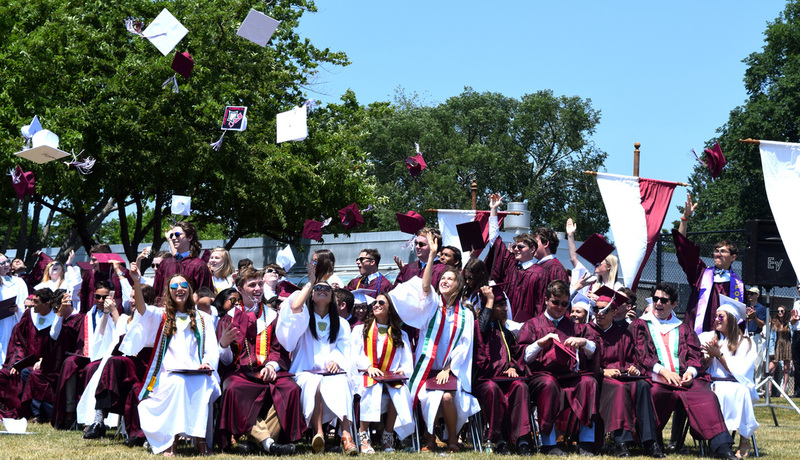 The ceremony was led by Principal Albert Cousins with speakers including Superintendent Dr. Edward Melnick, Valedictorian Gabrielle Farb, Salutatorian Emma Kleemann, and North Shore Board of Education President Dr. Herman Berliner. To begin the ceremony, the Pledge of Allegiance was led by Senior Class Presidents Andrew Douglas and Talia Pelts followed by the National Anthem sung by Cassandra Schadt, accompanied by members of the North Shore High School orchestra conducted by Mr. Jason Domingo. Congratulations to the Class of 2016 including: Sara Abbondondolo, Jacob Abramowitz, Jillian Agostino, Julia Albanese, Isabella Alessandrini, Zeeshan Ali, Alec Alletto, Ali Aly, Paul Andris, Elisa Anobile, Angelo Antinori, Kevin Arroyo, Sajel Arya, Anna Aureliano, Justin Baadarani, Mitchell Bailey, Victoria Barcellos, Stephanie Bazan, Leonard Belfiore, Brett Bennett, Isabel Berliner, William Binninger, Nicholas Blunnie, Peter Bodo, Brooke Bonn, Shannon Borucke, Cody Brady, Dylan Brady, Wilson Braun, Vito Cammarano, Claudia Cannam, John Carbonara, Cathryn Casatuta, Frank Castiglione, Alexandra Cefalu, Sarah Checca, Brian Ciampa, Dane Cohen, Olivia Colozzi, Jamie Commando, Madalyn Conklin, Carolann Connelly, Sophie Cooke, Kelly Cotter, Ian Coughlin, Demetra Coutsoukes, Connor Creavin, Julia Cuite, Stephanie Cuomo, Julianna Damiano, Christ David, Emily Davidow, Stephanie Davila, Theresa Della Ratta, Winston DeMartini,James DeMayo, Mailande DeWitt, Christian Jacob Diaz, John DiLeo, Andrew Douglas, Francis Dromm, Mary Dzyr, Claudia Escalante, Antonio Evangelista, Gabrielle Farb, Shepard Farrally-Plourde, Daniel Feehan, Theodore Fekula, Alana Ferrara, Daniel Fimognari, Cleo Fleming, Ayanna Fossett, Joseph Gabriel, Katerina Ganasoulis, Angela Geraci, Daniella Geraci, Dorothea Geraci, Amanda Giannattasio, John Gilligan, Courtney Gilmartin, Jessica Gioia, Sydney Goldman, Matias Gonzalez, Alyssa Greaney, Matthew Greco, Nicholas Green, Patrick Griffin, Thomas Grogan, Ivana Hajok, Jessica Hannon, Matthew Hardie, Sarah Hartman, Aliesha Giambrone Hatalovsky, Ishar Hawkins, Connor Hehn, Kevin Henneberger, Jose Henriquez, Juan Henriquez, Amelia Herrera-Chappell, Benjamin Hershfeld, Daniel Higgins, Marlena Hirsch, Marianna Hoitt-Lange, James Hoyle, Danielle Inzerillo, Michelle Jaco, Grant Jacome, Sonia Jain, Brandon Jarkow, Kelly Johansen, Alexander Kennedy, Sarah Mae Kimmel, Emma Kleemann, Konstantine Kolilias, Matthew Kolkhorst, Thea Kraus, Lena Kutscher, Alexander Lacomba, Harrison Laderer, Alexander Laurens, Emma Lebbens, Anthony Leonardi, Jack Lincoln, Nicholas Lucchese, Fergus Mackenzie, Jillian Magner, Alejandra Maldonado, Sanjay Malhotra, Eleanor Manacchio, Joshua Mandell, Monica Manfredonia, Anne Marchildon, Constantine Martinez, Grace Martino, Joseph Martino, Nicholas Martone, Elias Mastakouris, Austin McCusker, Patrick McGillicuddy, Tara McGillicuddy, Carly McGowan, Jessica McGowan, Sophia Mele, Stephanie Melfi, Franklin Merlis, Andrew Michalak, Daniel Miller, Lauren Montgomery, Monica Morra, Cassidy Morrison, Emily Moser, Akbar Mustehsan, Bradley Naddell, Cecilia Nelson, Morgan Nerud, Daniella Netch, John Nizich, Alyssa O'Rourke, Murat Ogeturk, Alec Ohanian, Olivia Olsen, Kyle Olstein, Francesca Orban, Dylan Otis, Pamela Otis, Eloise Parisi, Bennett Parker, Talia Pelts, Misha Perelmuter, Robert Piascik, Jeffrey Plotka, Miranda Purcell, Neilkaran Rawal, Julia Reilly, Tyler Rieger, Michael Roberto, Anna Rothenberg, Eva Rothenberg, Carly Rovner, Nicholas Ruggiero, Jonathan Ruiz de Castilla, Laura Russo, Kristina Sacco, Stephen Saccone, Nicholas Sakry, Luke Salditt, Benjamin Saltzman, Reid Saltzman, Cassandra Schadt, Nicole Schatz, Ksenia Schidlovsky, Maxwell Scott, Lisa Sebetic, Brook Sehring, Eric Shmuely, Isabella Sicuranza, Hunter Sobel, Richard Song, Abigail Spinelli, Joseph Spivack, Brendan Sullivan, Cassandra Sullivan, Luke Sweeney, Christine Syracuse, Giulianna Telvi, Gabriel Temidis, Shelby Tesoriero, Marcella Tocco, Brooke Turner, Alaina Van Pak, Maria Varela, Nicolas Vela, Jacey Vermeersch, Gianmarco Vigliotti, Diana Vizza, Ana Maria Vulpis, Hannah Webb, Jack Williams, Thomas Wilson, Brendan Zbikowski, Danielle Zbodula, and Stephanie Zelenetz. Best of luck and success to the students in the North Shore High School Graduating Class of 2016. The following students have Graduated with Distinction: Sara Abbondondolo, Julia Albanese, Paul Andris, Stephanie Bazan, Cathryn Casatuta, Frank Castiglione, Alexandra Cefalu, C. Jacob Diaz, Andrew Douglas, Gabrielle Farb, Cleo Fleming, Katerina Ganasoulis, Courtney Gilmartin, Emma Kleemann, Elias Mastakouris, Monica Morra, Talia Pelts, Julia Reilly, Lisa Sebetic, Dianna Vizza, and Stephanie Zelenetz. At the conclusion of the ceremony, the North Shore Alma Mater was led by Grace Martino. Many thanks go out to music teacher, Jason Domingo, and the North High School Orchestra. Principal Cousins thanked all of the parents and their families. He told all of his graduating seniors that he was very proud of them and wished them the best of luck in the future! Congratulations to the Class of 2016! Best of luck to the North Shore High School Class of 2016. Best of luck in the future! It is clear from reviewing Gabrielle’s extensive list of awards and honors that she has approached every challenge of her high school career with hard work, passion and dedication. This is reflected in her numerous accomplishments including: Clarkson Achievement Award, George Washington Medal, Long Island Press High School Journalism Awards, National Spanish Exam Bronze Medal, Knight of Columbus Student of the Month Award, AP Scholar Award, Science and Math Student of the Month – just to name a few! In addition, Gabrielle also received five gold medals and one silver medal at the Long Island Math Fair and was a member of the National Honor Society and the High Honor Roll. While her academic accomplishments have been outstanding, Gabrielle also participated in a myriad of fulfilling activities including being a Co-Captain of the Relay of Life Team, Co-Vice President of the Student Government, a Mu Alpha Theta Secretary, Peer Leader, and Mathlete. She also was a Co-Captain of the Bowling Team, member of the Key Club, Newspaper, and Yearbook Club, and played the Violin in the North Shore Schools orchestra. She will be attending the University of Connecticut Honors Program where she will be majoring in biology and minoring in math. Everyone at the North Shore Schools is very proud of her many accomplishments and wishes Gabrielle only the very best of luck now and in the future. Over her past four years at North Shore High School, Emma has truly excelled. Among her long list of honors, she received the following: Harvard Book Award, National Spanish Exam Bronze Medal, Scholar Athlete Award, English Scholar of the Month, North Shore Varsity Athlete Award, MVP for Varsity Girls Gold and All Division in Golf Awards. She is also an AP Scholar with Honors and was a member of the National Honor Society and the National Spanish Honor Society. Emma has also participated in the Debate Team, Spanish Club, Key Club, Yearbook Club, Prom Committee, Reader Leaders, Writing Fellows, and was a Peer Leader. In addition, she was on the Girls Varsity Field Hockey Team, Girls Varsity Golf Team, and Girls Junior Varsity Lacrosse Team. During the 2016 North Shore High School Commencement Ceremony, Emma said, “The Class of 2016 is truly like no other for we are comprised of students with extremely diverse passions and aspirations. Whether in the classroom, the lab, the art room, the theatre, or athletic field, the Class of 2016 has prospered in every aspect. She concluded by saying, “It is crucial that you find a balance between keeping an open mind to others, yet also sticking to your own and focusing on your own development as an individual. Never forget to profusely thank those who have broadened your sphere of knowledge and helped you get to where you are today as an individual and intellectual…” Congratulations to Emma Kleemann as you embark on your years at Boston College studying biology and in all of your future endeavors! Lots of luck to both Gabrielle Farb and Emma Kleemann. We at the North Shore Schools are all so very proud of both students and congratulate them for their dedication, passion, courage, and talent. This is only the beginning and we celebrate you and the entire North Shore High School Class of 2016. Congratulations to Gabrielle Farb, North Shore High School Valedictorian, and Emma Kleemann, North Shore High School Salutatorian. Best of luck!